Abstract: China has become the country with the largest aging population in the world. Thus, a major political, economic, social and cultural problem confronted by China is how to actively cope with the aging population and ensure that hundreds of millions of elderly people spend their remaining years in comfort. This study investigated the aging problem in China using methods such as literature review, content analysis, a social and historical study, a policy comparison study, and welfare theory building. 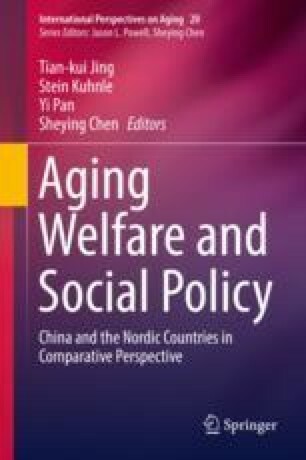 Based on characteristics of the time, such as political philosophy, government function orientation, modernization, social division of social welfare responsibilties, and the quality theory of system construction, this article first divides the period from 1949 to 2015 into four historical development periods for the welfare policies and regulations of the elderly in China. Special attention is paid to systematically sorting the scope and contents of policy and regulation frameworks issued by the central government and vicissitude track of priority fields since the reform and “opening up.” Secondly,the study first proposes and discusses 10 core issues of modern welfare system construction for the elderly. Three, The theme and the key point of the paper is to closely focus on the basic theories and policy issues of welfare policies and regulations for the elderly, to comprehensively analyze existing structural defects and systematic deficiencies of the welfare policy and regulation framework for the elderly in China, and to summarize the basic characteristics of the welfare policies and regulations for the elderly in China. The aims are to comprehensively and objectively describe the overall trends and historical evolution of the welfare policies for the elderly in China, scientifically summarize and extract the historical experiences and lessons of the development of welfare policies and regulations for the elderly in China, forge and bring forward several policy issues of basic theories emerging from the development and evolution of welfare policies for the elderly in China, and thus highlight the issues with quality standards of welfare system construction for the elderly. Finally, The basic finding and conclusion is the historical modes of welfare policies and regulations for the elderly in China are presented as typical individual cases, in which the formal system construction mode and substantial system construction mode are clearly distinguished; the connotation, denotation, scope, content, and measurable indicator system for the quality of the welfare system for the elderly in China are theoretically established; and a development direction for the modern welfare system mode in the framework construction of a modern social welfare system in China is proposed. The study provides a comprehensive realization of a moderately prosperous society in terms of welfare, the dream of a great rejuvenation of the Chinese nation, the promotion of world peace, and the development and inheritance of Chinese wisdom. This study was a phased objective of a key project of the National Social Science Fund led by Professor Liu Jitong (15ASH00) as the Study of Modern Social Welfare System Construction with Chinese Characteristics. It is hereby clarified and acknowledgements are extended. The authors thank the doctoral candidate Dan Wang for the contributions to the article proofing who is from the Medical Humanities Institution of Peking University. For the history of the Office of the National Committee on Ageing and the China Association for the Aging, please refer to the official website of the Office of the National Committee on Ageing: www.cncaprc.gov.cn.